What would you do with it? What wouldn’t you do with it. Sure, the lump sum payout will only be $850,000,000 or so. Then, you are stuck with taxes of about 40%. So, you’re left with just slightly more than $500,000,000. Only a half billion dollars! And it could be yours! Sure the odds are pretty long, at 275,000,000 to 1. But, that’s not so much, is it? I mean, someone has to win it, right? Why not you? How many people live in the United States? A generally accepted number is 330,000,000. How far is it from Los Angeles to New York City? Most people say it’s about 3,000 miles. How fast were you driving the last time you got stopped by the cops? Ten over? More? 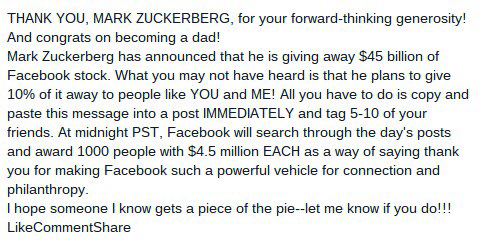 Maybe you saw this notice about Mark Zuckerberg, the founder of Facebook giving away $45,000,000. 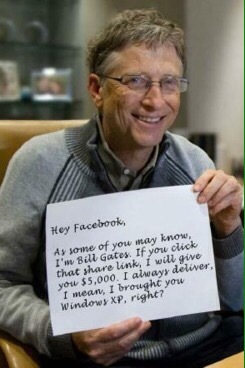 It’s similar to a meme that was popular a few years ago describing how Bill Gates would give you money for sharing a post. I don’t gamble, because I know a little about statistics. We’ve already established that someone will win the Powerball jackpot. Did you know that the odds of you winning the Powerball are exactly the same as the odds that Zuckerberg or Gates is going to cut you a check? You probably don’t believe me. You’re right now explaining that 275 million to 1, while really terrible odds, is still better than zero, which is the chance that a billionaire is going to start writing checks to random Facebook people. But, in fact, you’ve already agreed that the two percentages are the same. How many people in the United States? We said 330,000,000 right? Wrong. In 2014 the number was estimated to be 318.9M. Okay, I picked the 330M and it was off. I’ll even give you the 318.9M number. You are still wrong. Obviously we’ve had another year of growth and that number is rounded to the nearest hundred thousand. The true number, the exact number is much more precise. We round those big numbers because it makes it convenient to talk about. And 318,900,000 or even 330M is close enough. We have set the number of significant digits to 4 (3189.) We know the number is more, but we are pretty sure that we are correct to the nearest hundred thousand. How far from LA to NYC? We said 3,000 miles. Actually, according to Google maps, it’s 2,790.7. That’s a pretty exact number right? Five significant digits. But, even if it’s right, we are rounding again to the nearest tenth of a mile. A tenth of a mile is about 527 feet. Almost two football fields long. Not too bad an estimate if you are driving, but quite a ways off if you were trying to hit something with a baseball. But, we agree that miles are generally an acceptable measurement. If I told you it’s 40 miles from my house to Salt Lake City, you’d probably accept the fact that it’s not exactly 40. When the nice man in the uniform with the blue lights on his car pulled you over how fast were you going? I clocked you going 49 in a 25. But, were you going exactly 24 miles per hour over the speed limit? Of course not. Your car’s speedometer and the cop’s radar are not that precise. But, we agree that two significant digits is good enough. How precise do you think you could get in a measurement before it becomes impractical to get any more precise? With temperature, we accept 3 significant digits. If 98.6 is good. 99.0 represents a slight fever. 95.0 degrees and you are becoming hypothermic. But, would you buy a thermometer that promised to show your temperature to the hundredth of a degree? 98.65 degrees? Or 95.06 degrees? Probably not. How about a speedometer that showed you the hundredths of a MPH? I stopped you for going 49.56 in a 25 mph zone! What about a speedometer that measured the speed to twelve significant digits? You were going 49.5600000036 in that 25.0000000000 zone! The Powerball odds are 1 in 275,000,000. That means you have a 0.00000036% chance of winning. We’ve talked about significant digits and how we use them in our everyday lives. To two, three, four, five even at six significant digits, your odds of winning Powerball are zero. I would venture to say that there is probably nothing in your life, unless you work with really small numbers, that you measure to six significant digits. By the measurements that you and virtually everyone else uses, the odds of you winning the Powerball are zero. . .exactly the same odds as Gates or Zuckerberg sending you a check. Thanks. Check back on Wednesday. . .Maybe we won!